One of my favorite things about spring is seeing flowers in bloom everywhere I go. Daffodils have recently bloomed in our neighborhood, and this week I spotted some tulips (one of my favorites) in a neighbor’s yard. I have lots of buds on my lilac tree, I always look forward to those fragrant blossoms! One of my longtime (internet) friends, Haniela, loves flowers as much as I do. She also loves cookies… it’s no wonder we’re friends! Haniela thought it would be a fun idea to gather all of her cookie loving friends and make a beautiful, edible flower bouquet! 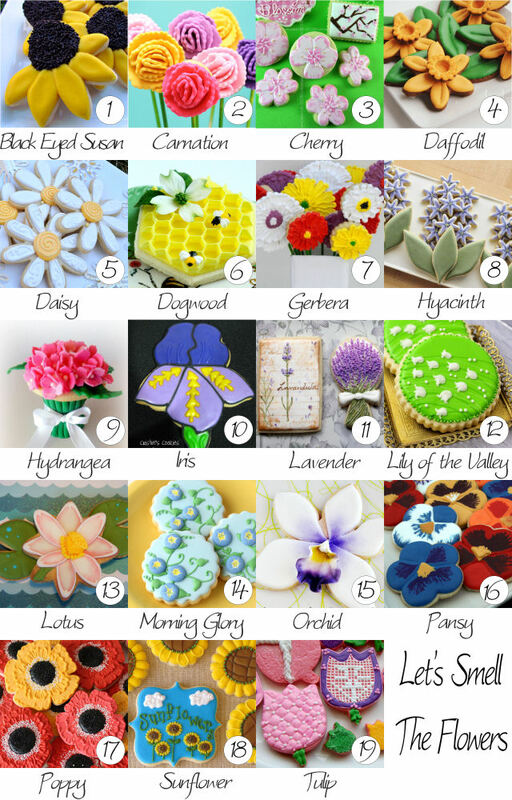 Each cookie maker was assigned a flower to bring to life in cookie form! I was given Morning Glories… any easy choice (since my name is Glory!) I’d never seen morning glory cookies before, but looked forward to the challenge. To me, one of the main features of morning glory flowers is the fact that they grow as a vine. 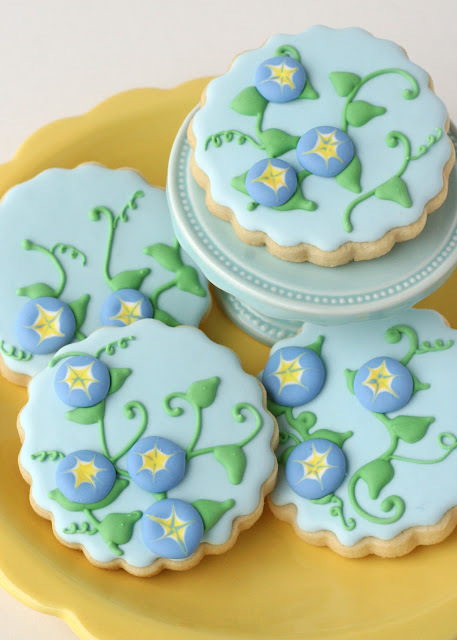 I wanted to incorporate the vine, as well as the blossoms onto a cookie. 1. 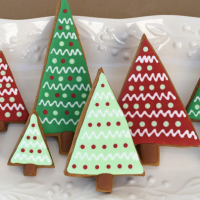 Create royal icing transfers. Pipe a nice full circle of medium consistency blue icing onto a piece of parchment paper. 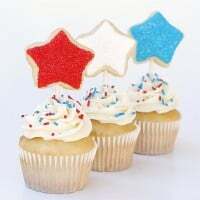 Immediately add a dot of white icing, then a dot of yellow icing, in the center of the blue. Working from the center, use a toothpick to drag the white and yellow color toward the edge of the blue dot. Allow the transfers to dry several hours before removing from parchment. 2. 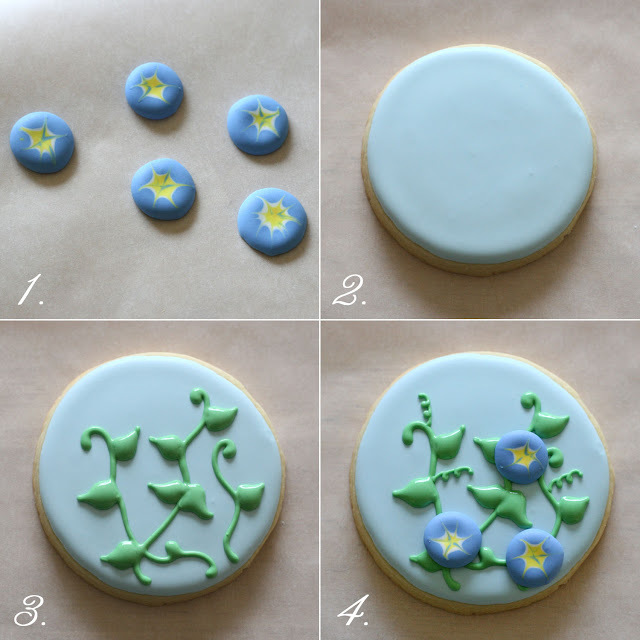 While the royal icing transfers are drying, outline and flood your cookies, and allow them to set as well. 3. When your base icing has set (2-4 hours), use green icing to draw morning glory vines and leaves. 4. While the leaves and vines are still wet, add your flower transfers. Add small vine details as desired. Allow to dry fully before eating or packaging. Now here’s the fun bonus… the most beautiful (and delicious!) collection of flowers ever! Each cookie below was made by a different cookie artist. Please take some leisurely time to enjoy each post, linked below. Thanks to Haniela for dreaming up this beautiful project! Take some time today to smell the flowers! Oh my god, the details on the cookies are just amazing! Really amazing! This cookies are so beautiful! Glory, How schmoly! These are absolutely stunning cookies! I'm not a cookie decorator, just enjoy looking at what you are able to create! These are amazing!! Glory! You hace a nice and lovely blog! One question: is'ts royal icing the blue dot? Or sugrarcraf ? So pretty – love the way you put it all together!! They look amazing, so beautiful! These are gorgeous cookies, all of them really… Congratulations to you all! 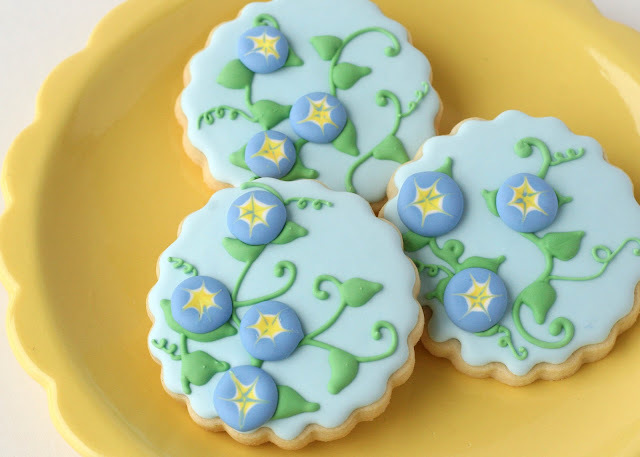 When I saw your cookies it made me smile that you got “Morning Glories” you did a wonderful job with this flower. I wouldn’t have known where to start; I must say you got a tough one. i am drooling over your food pics…..sooo yummy looking! We love morning glories. We planted some just recently to grow up our lattice. Speaking of lattice, how creative!!! These are perfect!!! These are so pretty! I must make them for my mom who loves this flower and has 100s of them growing up the fence on her back porch. beautiful Glory!! Love the lattice ones!! Glory, these are so sweet! 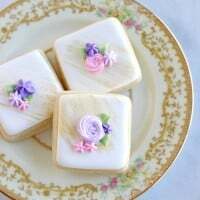 The addition of the vines & the lattices make these cookies seem so feminine & soft – just utterly beautiful. Job very well done, friend! Wow. I love these. They totally look like morning glory's to me. I love the detail and the trellis. Such PRETTY cookies! The colors are so soft and soothing. My favorite cookie is the morning glories entwined on the trellis. They are Spring in cookie form! Just lovely! Absolutely stunning, Glory! They're perfect in every way… I love the colors, the clean lines… so lovely! I love your tutorial! Using RI transfers was a brilliant idea!! Your cookies are beautiful!! My sister had a literal wall of morning glories grown up the fence in her back yard. It was beautiful in the summer to go outside on the deck and drink your coffee with these beautiful climbing flowers greeting you all in their *Morning Glory*. Your cookies are just lovely and the addition of the white lattice for them to *climb* on is perfect. The Cookies are all so pretty! What a fun project! I wanted to grow these few year back but I wasn't successful maybe this time around I'll make cookies instead. One of my favorite flower color combinations is blue and yellow, so pretty. Love these, they're beautiful! I love the ones growing up the trellis. Such an art. These would be so pretty in an Easter basket. Beautiful! They are exactly the same color as the ones that used to grow on my fence. Loving the vines, too. I knew they were morning glories right when I saw them! Tell James to plant some by your fence and then he can see the blue dots! This is a really neat idea and the cookies are lovely! Love you! These are soooo sweet! The colors and the curly little vines! And then the blossoms on the lattice? I adore these. I have got to do more RI transfers, I love the dimension and it breaks up the process. BEAUTIFUL! gosh they look pretty. I love the trellis idea. Beautiful! Oh my goodness — these are SO SO pretty!! I am absolutely IN LOVE with the cookie where they are climbing the trellis. SO BEAUTIFUL. They are perfect! Glory these are so beautiful! 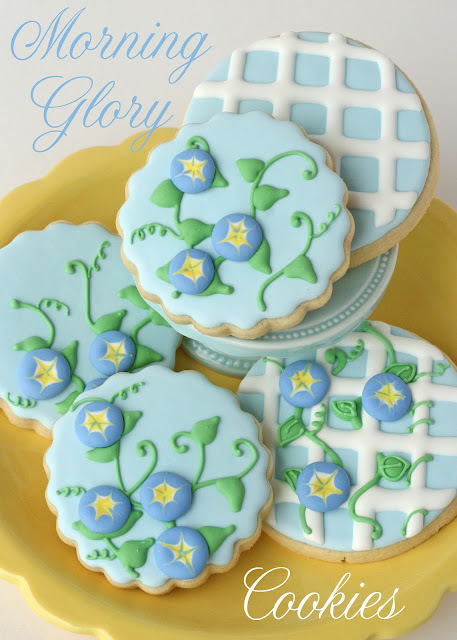 I don't know what Morning Glory's are supposed to look like, but I can't imagine they could be any prettier than your rendition on a cookie! I especially love the one winding around a trellis. Very creative and beautifully detailed! Thanks for sharing Glory! These are so beautiful! I seriously am having cookie envy right now. These are gorgeous! I got some icing pens for Christmas, struggling to get the hang of them though! The neatness of your icing is unreal! I've just now taken time to look at this post. 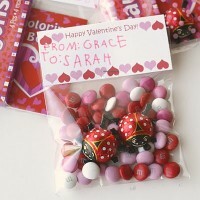 These are so sweet, I'm going to try my hand at them! As for morning glories, oh, girl…if you could only see our vegetable garden in the summer. The flowers are lovely but the vines are pesky and will take over everything in sight if they aren't pulled regularly! Hola!! no sé si entenderás español, pero no he podido resistirme a entrar en tu blogg cuando he visto estas fantásticas galletas de flores primaverales, me han encantado!! yo me he iniciado hace muy poco en el decorado de galletas y me quedo por tu página a disfrutar de tus creaciones, aquí tienes una seguidora más!! Felicidades por el blogg!! Oh my goodness, that technique is perfect for morning glories! Brilliant! !